Yatra Gift Voucher Flat 20% Off, Yatra GV 20% Off, Yatra Gift Voucher Offer, Yatra GV 20% Discount, Use Yatra GV to book Domestic / International Flight Ticket or Bus Ticket. So, you can save 20% using Yatra GV. 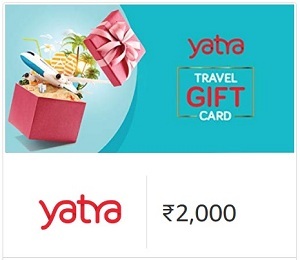 You can also use Multiple GV (Maximum 3 GV) Per Transaction on Yatra Website / Apps, Amazon Offers on Yatra Gift Voucher at 20% Discount on E-Gifts – Rs. 500, Rs.1000, Rs.1500, Rs.2000, Rs. 5000 and Rs. 10,000 denomination.